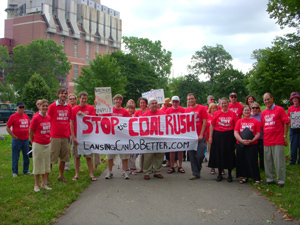 In late May 2008, the Lansing Board of Water and Light (LBWL) proposed the construction of a 350 megawatt (MW), 1 billion dollar power plant to be fired primarily by coal. In an internal review, LBWL considered several different options including a projected carbon tax of $10 per ton. LBWL decided that upgrading the current Eckert Power Station would not be an economical choice. LBWL claims an electric growth rate for the service area or 1.4% per year, in spite of the generally flattened demand for power in the state as a whole. LBWL has indicated an intention to meet new growth though energy efficiency and renewables, but claims a need for replacement of base load power, and that transmission costs make purchase of outside power too expensive. LBWL has been criticized for not including community and environmental groups in the decision making process. The Lansing State Journal has noted that with the changing climate for coal development, this project and others around the state may be in trouble. On February 3, 2009, in her State of the State address, Governor Granholm asked the Michigan DEQ to halt the permitting process for seven proposed power plants, including the Lansing plant. She called for further analysis of Michigan's future energy needs and clean energy alternatives. On July 16, 2010, the Lansing Board of Water and Light announcedit will build a $182 million combined-cycle, cogeneration plant that produces both electricity and steam for its customers. According to the BWL press release, "The highly efficient, state-of-the art facility will be fueled by natural gas, not coal. The switch to natural gas will reduce greenhouse gas emissions by 50 percent, compared to the BWL’s existing steam plant." "By switching to natural gas at the new facility, the BWL will avoid burning 139,000 tons of coal each year. Greenhouse gas emissions will be dramatically reduced – 50 percent less than Moores Park." the release stated. 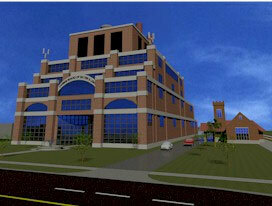 The facility will also derive efficiencies through a "combined heat and power" approach, with 225 steam customers, including government offices for the State of Michigan and the City of Lansing; the Accident Fund, Lansing Community College, Boji Tower, the state Capitol building and the new Michigan State Police Headquarters. Michigan Sierra Club director Anne Woidwode expressed satisfaction with the move, in an emailing, saying, "while we are still looking at a fossil fuel, this turnaround is a dramatic reminder of the power of the public in a publicly owned system to insist on better ideas." The plan is for wind turbines and solar panels to be integrated into the facility's roof. BWL is already owner of the Cedar Street solar array, the state's largest. BWL began transporting more than 400,000 cubic yards of coal ash residue generated from its now defunct Ottawa Power Station between 1964 and 1978 to a landfill in Granger, Michigan. In 2009, BWL started removing the ash, and in 2010 said it had removed about 35 percent of the coal ash so far. BWL projects the project should last about a year to a year and a half, at which point they will fill it all in, and plant some trees. Responding to resident concerns about safety, BWL's executive director of planning George Stojic admitted there "is leaching into the upper aquifer of some trace minerals, not into the drinking water." Officials promised to be as open as they could with test results of the minerals leaking into the upper aquifer. Susan Harley, policy associate for Clean Water Action, said Stojic's report wasn't satisfactory, and vowed to follow up with state environment officials. A 2010 investigation found elevated levels of arsenic and mercury in run-off from a site where the Lansing Board of Water & Light is storing coal ash near Grand River, Michigan. A sample taken from soil that had breached a broken silt fence at the facility after a heavy rain in September showed arsenic and mercury at more than twice the maximum normal level. Stephen Boyd, a professor of crop and soil sciences at Michigan State University, analyzed the soil test results that MSU Extension sent to A&L Great Lakes Laboratories in Indiana at City Pulse’s request. Boyd said the “normal” range for arsenic in soil is between one and 50 parts per million (ppm), while for mercury it’s between .03 and .6 ppm. The results showed arsenic at 119 ppm and mercury just below .59 ppm. Lansing’s BWL is in the process of moving 450,000 cubic yards of coal ash from the Comfort St. location to a landfill operated by Granger. The excavation is expected to extend into next fall. In view of the elevated arsenic level detected outside the ash storage site, people are questioning whether the two foot high silt fences that surround the property are enough to contain the ash in the event of a heavy rainfall. Before we rush to build more coal plants, we need to protect our families and future against the threats of global warming and carbon dioxide by first investing in clean, renewable energy and efficiency. We believe that investing in more coal before renewable energy will hurt jobs, hurt ratepayers, and provide viable harm to public health and the environment. ↑ 1.0 1.1 Lawrence Consentino, "Soot and the City" City Pulse, June 4, 2008. ↑ Michigan's 21ST Century Electric Energy Plan: Appendix – Volume II: Workgroup Reports, Michigan Public Service Commission, January 2007. ↑ Lawrence Consentino, "Burned out", City Pulse (Lansing, Michigan), August 13, 2008. ↑ "Coal Shoulder: How hard did BWL try to find an environmentalist for its pow er plant advisory committee?, Pulse, September 24, 2008. ↑ Christine Rook, "Push to go green may undo BWL plans, five other plants", Lansing State Journal, March 4, 2009. ↑ "BWL to Neighbors: Coal Ash Removal Project Safe" wilx.com, July 22, 2010. ↑ 9.0 9.1 Eartha Jane Melzer, "Toxins detected in soil outside Lansing coal ash storage site" The Michigan Messenger, Nov. 18, 2010.